The long and complicated journey to detect the Higgs boson, which started with one small step about 25 years ago, might finally have reached its goal. This was reported by LHC particle accelerator scientists today at the European Laboratory for Particle Physics, CERN, near Geneva. The Higgs boson is the final building block that has been missing from the “Standard Model,” which describes the structure of matter in the universe. The Higgs boson combines two forces of nature and shows that they are, in fact, different aspects of a more fundamental force. The particle is also responsible for the existence of mass in the elementary particles. Weizmann Institute scientists have been prominent participants in this research from its onset. Prof. Giora Mikenberg was for many years head of the research group that searched for the Higgs boson in CERN’s OPAL experiment. He was then leader of the ATLAS Muon Project – one of the two experiments that eventually revealed the particle. Prof. Ehud Duchovni heads the Weizmann Institute team that examines other key questions at CERN. Prof. Eilam Gross is currently the ATLAS Higgs physics group convener. In the Weizmann team three scientific “generations” are represented: Mikenberg was Duchovni’s supervisor, who was, in turn, Gross’s supervisor. Most of us experience the world as a diverse and complex place. But the physicists among us are not content with visible reality. They are striving to get to the bottom of that reality and to see whether it is, as they think, based on the absolute simplicity displayed by the early universe. They expect to observe a range of particles that are different “ensembles” of a handful of elementary particles. The scientists are hoping to see a unification of the four fundamental forces of nature that act on these particles (the weak force responsible for radioactivity, electromagnetic force, the strong force responsible for the existence of protons and neutrons, and gravitation). The first step in the journey to unify the forces was completed with the almost certain discovery of the Higgs particle: The union of two elementary forces – the electromagnetic and weak force, to become the electroweak force. In the effort to discover the Higgs boson, unify the fundamental forces and understand the origin of mass in the universe, scientists built the world’s largest machine: a particle accelerator nestled in a 27-km-long circular tunnel, 100 meters beneath the border between France and Switzerland, in the European particle physics laboratory, CERN, near Geneva. This accelerator, called LHC (Large Hadron Collider), accelerates beams of protons up to 99.999998% the speed of light. According to the theory of relativity, this increases their mass by 7,500 times that of their normal resting mass. The accelerator aims the beams straight at each other, causing collisions that release so much energy, the protons themselves explode. For much less than the blink of an eye, conditions similar to those that existed in the universe in the first fraction of a second after the Big Bang are present in the accelerator. As a result, particles of matter are turned into energy, in accordance with Albert Einstein’s famous equation describing the conversion of matter into energy: E=mc2. The energy then propagates through space and the system cools. (Something similar happened in the early evolution of the universe.) Consequently, energy turns back into particles of matter and the process is repeated until particles that can exist in reality as we know it are formed. The collisions produce energetic particles, some of which exist for extremely short periods of time. The only way to discern their existence is to identify the footprints they leave behind. For this purpose, a variety of particle detectors were developed, each optimized for capturing particular types of particles. The likelihood of creating the Higgs boson in a single collision is similar to that of randomly extracting a specific living cell from the leaf of a plant, out of all the plants growing on Earth. To cope with this task, Weizmann Institute scientists, headed by Prof. Mikenberg, developed unique particle detectors, which were manufactured at the Institute, and in Japan and China. These detectors have been adapted to detect muon particles. In some of the very rare collisions that produce Higgs particles, the footprint of the Higgs particle – that which is recorded in the detectors – is four energetic muons. 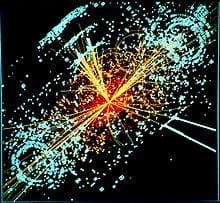 Thus, the detection of such muons provides circumstantial evidence for the existence of the Higgs particle. The scientists analyzed data from a thousand trillion proton collisions; in these Higgs bosons are created along with many other similar particles. Evidence to suggest the existence of the Higgs arises through searches for anomalies in the collected data (in comparison with the expected data if such a particle does not exist). This search focuses on the estimated mass of the particle: 126 trillion electron volts (Gev). When the scientists do manage to find such anomalies, they must then rule out the possibility that it is due to statistical fluctuation. CERN scientists invented and developed the computer language and basic concepts that later served as the basis for the establishment of the Internet. In fact, the first server of the “World Wide Web” was activated in CERN to facilitate communication between scientists from around the globe participating in experiments carried out locally. The organization also served as a model for the establishment of the European Union, and its influence on Europe’s technology and economy is reminiscent of the American space program. The LHC particle accelerator is based on superconducting electromagnets working at very low temperatures: less than two degrees above absolute zero (minus 271° Celsius). It generates about one billion particle collisions per second: If they were people, it would be as if each person on the planet meets every one of the six billion inhabitants of the world every six seconds. Calculating and analyzing data from these collisions is like trying to understand what all the inhabitants of the world are saying, while each is holding 20 telephone conversations at once. This experimental system includes the world’s largest superconducting electromagnets, built in conjunction with Israeli companies. The entire structure includes 10,000 radiation detectors spaced just one millimeter apart, has a volume of 25,000 cubic meters and features half a million electronic channels. Most of the muon radiation detectors were built from components produced in Israel. A unique laser system tracks the exact location of the detectors with an accuracy of 25 microns (half the thickness of a human hair). Not sure what your trying to say, not finding the particle would have provided evidence that the standard model is somewhat flawed and that would of been even more exciting news. so fail to see how you could ever classify the money as “going for nothing”. So, money didn’t go for nothing and science never fails. I assume 126 billion electron volts.